A year ago, in May 2000, we rounded up our troops, packed our bags, and moved out of our little theatre in Silver Lake and into our new home at Burbank Center Stage on Third Street, in bustling downtown Burbank. A year later, we are happy to say the dust has settled and we are thriving in our new surroundings. Audience support is at an all-time high and subscription sales are booming, partly due to our recent shows, The Man Who Came To Dinner, The Cocktail Hour, and particularly the success of The Last N ight of Ballyhoo, which was an unqualified hit. Not only have we hit our stride artistically in our new home, but, in the past year, we have been very successful in creating a connection with our community, increasing neighborhood support and developing new audiences. We have continued our program of reaching out to senior centers and charitable groups in the local area, and have held fundraisers during our preview performances for the Joslyn Adult Center and the Burbank chapter of the Salvation Army. We have also been gratified by the warm welcome we have received from our neighbors, as local restaurants and businesses have been eager to partner with us. If you have been to the theatre in the past month, you have noticed the upgrade in our lobby décor, thanks to IKEA, which has furnished the area, free of charge, with comfortable chairs, a sofa, tables, lamps, and potted plants. Our neighborhood florist, Bardwell's on the Boulevard, provides complimentary fresh flowers every week, displaying gorgeous arrangements that take our breath away. 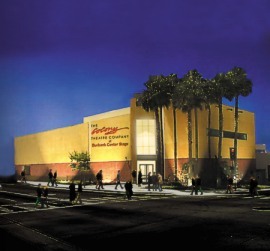 The gallery, located just off the main lobby, now features rotating themed exhibits from Bittan Gallery of Fine Art, with a portion of every sale going to the theatre. Mi Piace sponsors and caters our Opening Night parties. In addition, many of our restaurant sponsors feature special offers for our subscribers, from free appetizers and desserts to percentage discounts. These partnerships will continue to grow and thrive, and our audience will reap the rewards. We are very grateful to all of our new friends for recognizing our value to the community. You can help us say "thank you for your support" by patronizing the establishments listed below. Be sure to tell them you heard about them through The Colony! While we are looking forward to expanding to full capacity (see Mid-Sized and Loving It!) and to future seasons, we are also keenly focused on our current season and the excitement it brings. Every season offers great anticipation and new opportunities for us to showcase our talent, mine new treasures and expand our artistic horizons. We are thrilled to announce that the shows we have chosen for this season will achieve all three. Our first show closed on July 8 and kicked off the season with great fanfare. The Last Night of Ballyhoo, by Alfred Uhry, is a beautifully crafted play by the Pulitzer Prize-winning author of Driving Miss Daisy. Critics unanimously raved about its charm and thoughtfulness and we couldn't have agreed more. Set in Atlanta in 1939, The Last Night of Ballyhoo tells the story of the assimilated Jewish population of the South. Hitler has just invaded Poland, but the members of the Freitag family are more con cerned with the opening of "Gone With The Wind" and who will be attending Ballyhoo, the social event of the season. Only when they are confronted with their own anti-Semitism by a handsome stranger do they realize that there may be more to life than Ballyhoo after all. Critics praised Ballyhoo, calling it "A captivating production," and "energetically performed, solidly directed." The Los Angeles Times noted that The Last Night of Ballyhoo "mixes incisive wit with the humane, warm-toned Southern charm y ou'd expect from the author of Driving Miss Daisy." In September, after our summer off (see Summer Plans), we will be presenting The Clearing, by Helen Edmundson. An exciting and captivating new drama, The Clearing focuses on a little-known bit of 17th century European history, illuminating a time when the English tried to rid Ireland of the Irish, in an attempt at ethnic cleansing that planted the seeds of the troubles that still afflict that region today. The Sunday Times had this to say about the play: "Edmundson's writing is passionate, muscular....Sh e is doing for 17th century Anglo-Irish history what Arthur Miller did for 17th century New England history in The Crucible: creating an idiom which resurrects the past but brings its conflicts within touching distance of the present." The Clearing is scheduled to perform from September 22 through December 2, 2001. The season will conclude in February, 2002, with the fascinating musical Side Show, with book and lyrics by Bill Russell and music by Henry Krieger. A cult hit on Broadway in 1997, Side Show is about two beautiful, talented young women who find fame and fortune, and who also just happen to be joined at the hip. Side Show has played in regional theatres across the country, and has broken box office records everywhere it has played. A moving and powerful score supports an intriguing story of individuality and the strength of the human spirit. Critics have called Side Show "daring, enthralling...tremendously moving." The New York Post proclaimed it as "A bright and moving musical with poignancy and urgency and even a certain refreshingly unsentimental honesty that demands attention." Side Show is a replacement for our previously announced musical, Into the Woods, which we set aside because of the announcement by Stephen Sondheim and James Lapine that they would be reviving it at the Ahmanson next Febru ary. As with most situations like this, we are looking at it not as a disappointment, but rather as an opportunity. Side Show is a challenging show with depth and heart and we know our subscribers will embrace it and its gorgeous score with open arms. Side Show is scheduled to run from February through April, 2002. The season also includes three Second Stage productions, the first of which was Tom Griffin's modern comedy, Einstein and the Polar Bear. These Second Stage productions run concurrently with the mainstage productions with which they are packaged (Einstein and the Polar Bear was packaged with the mainstage production of The Last Night of Ballyhoo) and run on alternate nights of the week. The general public must pay $15 a ticket to see our Second Stage productions, but subscribers get them FREE! Not only are the Second Stage shows included in every subscription package, but subscribers may bring guests with them to every Second Stage show free of charge. What a great deal! For more information about our season, or to subscribe for yourself or a friend, call our office at (818) 558-7000. Even though two shows have already passed, the remainder of the season can still be purchased, at a pro-rated cost. The Clearing and Side Show will truly be the theatrical events of the year and only season subscribers are guaranteed seats to both shows. So call us today and join the most exciting new theatre in town! Did you notice a few more people in the theatre the last time you attended? We had been a 99-seat playhouse since 1975, but no longer! We have entered into a special agreement with Actors' Equity to use 168 of our 276 seats for this current season, before going to full capacity next year. This agreement provides for better compensation for our actors, which they unquestionably deserve, and which we are pleased to support. How can we afford to make this change when we have yet to raise our prices? We couldn't afford not to. Since the announcement of our impending move to Burbank in 1999, our subscription sales have been booming. Finding ourselves in a situation where we would have to run a show for up to four months (at 99 seats) just to accommodate our subscribers, we realized that it was time to find a way to open up more seats for each performance. Expanding to 168 seats not only enables us to accommodate our growing audience, it also allows us to shorten the runs of our shows. At 99 seats, including rehearsal and pre view time, an actor's commitment to a Colony show could stretch to well over six months! Actors of the caliber of talent we have in our company, who are in demand for lucrative film and television work, are hard-pressed to keep such lengthy commitments. Even with fewer performances, we still have more seats for each production. The expansion to 168 actually provides us over 200 more matinee seats (which are the most popular) over the run of each show. So if you have been finding it easier to schedule your reservations, it's not because our audience is shrinking! It's because we are now officially a mid-sized theatre and can accommodate more audience members at each performance. As to our long-term plans, we will be going back to Actors' Equity to negotiate a new contract by the end of this season, preparing us to expand to full capacity at 276 seats by the middle of 2002. Our current subscription and ticketing procedures will not handle the addition of over 100 seats, so we will be making some changes. We believe these changes will be for the better! The new system may include features such as assigned seating, season series passes that will assign set dates for each show, flex passes that will allow for busy schedules, or some combination of these ideas. The details are still to be determined. No matter which system turns out to be the best suited to our audience, we do know that it will involve some sort of assigned seating (no more sprinting for a seat) and physical tickets with a printed date on them (no more wondering when you're coming to the t heatre). As always, subscribers will still get first choice of dates and seats, with the general public taking what's left. We have an exciting future ahead of us and we look forward to sharing it with you! Q. Who are the reserved signs for in the theatre? A. We only reserve seats for people who fall into one of three categories: Handicapped patrons (who are seatedon the ground level), members of the working press (because they expect it) and donors who contribute $500 or more annually (because it's the only wa we have to thank them). All other seats are first come, first served. The Last Night of Ballyhoo closed on July 8. The Clearing, our next production, is scheduled to open on September 22. What will we be doing in the time between shows? We will be making things even better. While we love the new theatre and have spent the past year tinkering with and improving our new home, there are still a few kinks to be worked out, most notably the air conditioning system inside the theatre itself. The system, while sufficiently cold, is not compatible with a live theatre environment. Simply put, the air conditioning system is too loud. We will be working to make the system quieter and more efficient and to improve the acoustics in the theatre. So, hopefully, when you come to see The Clearing in September, you'll find your theatre experience to be cool, comfortable and focused only on the activity on stage, not above it! Alfred Uhry's endearing comedy The Last Night of Ballyhoo, was the first mainstage production of our 2001-2001 season. Set in Atlanta in December, 1939, the story revolves around the Freitag family, Southerners to the core, who also happen to be Jewish. Their Jewishness is just an element of their existence, not a reality, which explains why they seem so unconcerned with the news of Hitler's invasion of Poland. Instead, their primary concerns are who will be attending Ballyhoo, the social event of the s eason, and the opening of "Gone With the Wind," with its star-studded premiere being held down the street. Enter a handsome business colleague of patriarch Adolph Freitag, who confronts the Freitags with their heritage and the reality of being Jewish in 1939. The Last Night of Ballyhoo is a charming portrait with endearing characters and disturbing undercurrents. Uhry has crafted a subtle masterpiece, much like his Academy Award winning screenplay for his play Driving Miss Daisy. Critics were unanimous in praising our production, saying "A superb cast mines the material's humor and pathos....a splendid production." Showmag.com called The Last Night of Ballyhoo "An excellent production..... directed with a marvelously light touch...the cast fit their roles impeccably...a delight." The Burbank Leader continued, "This energetically performed, solidly directed production manages to nail both the comedy and dramatic undercurrents, offering hearty laughs and sobering moments in equal measure...a seamless tapestry of comedy, drama, and poignancy."